We are proud to provide the highest quality lessons from the best instructors on the best gear. Are certified instructors have been teaching for combined 30 years of experience! Along with our talented team of instructors we have partnered with some incredible product brands to make your experience even better! All lessons are provided on the latest Duotone Kiteboarding gear, the top brand in all of kiteboarding! We also utilize BbTalkin Intercom systems with all lessons. This allows your instructor to talk with you calmly over an intercom system linked inside your helmet while on the water. No more using hand signals, shouting, or dragging behind your instructor in the water with the BbTalkin system! To keep you looking cool on the beach and the California sun out of your eyes we have partnered with Ombraz Sunglasses. These unique sunglasses don't use your traditional side arms, but paracord that keeps the glasses firm to your face on and off the water! Click any of the images below to find out more information about the corresponding brand. ​We’ve all got to start somewhere, right? This lesson is your so-called “welcoming” into the sport of kiteboarding. Within the “Newbie Land Lesson,” we focus predominantly on wind theory and learning how to safely set up and fly the kites. 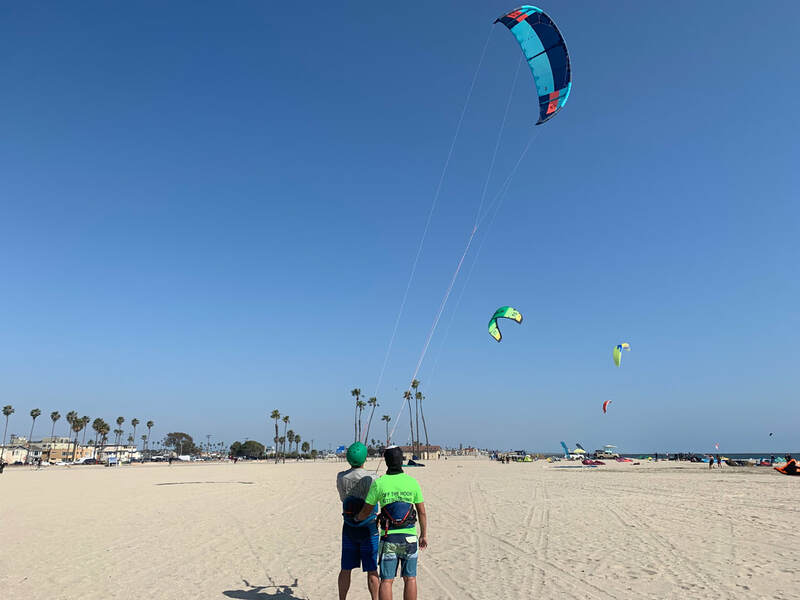 Since 80% of kiteboarding is about kite control, we like to use this lesson to ensure that our students can fly the kites with confidence in a controlled manner in all situations. This lesson is a great way to get a feel for the sport and see if it is right for you! Our instructor Tom works on kite control and one handed flying with his student. Our instructor Carter gets his student in the water for the first time! The BbTalkin headsets allow student and instructor to communicate while on the water! 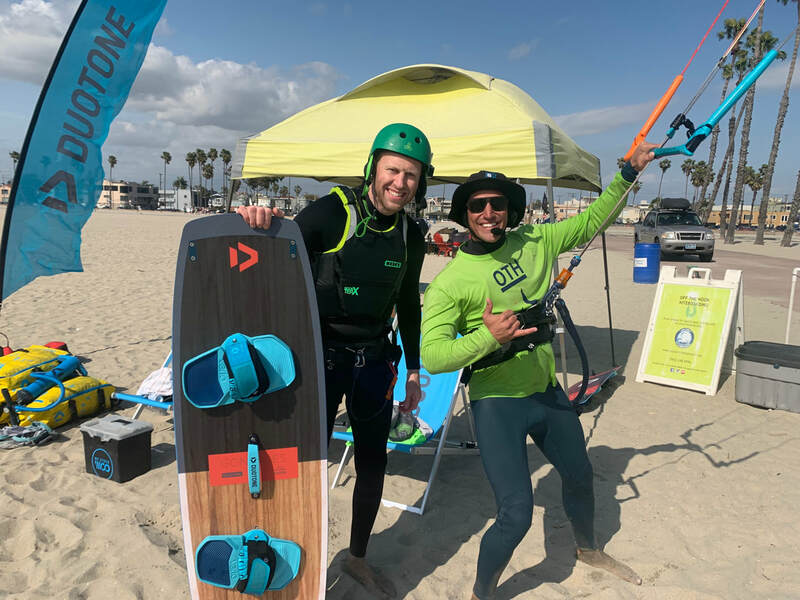 If you have taken our Newbie lesson package (or the equivalent elsewhere), and excited to continue with kiteboarding, then the Newbie Intermediate Lesson is calling your name! We typically start this lesson by reviewing the safety features of the kite, and then get you ready for your first water experience with a full size kite. We fine tune any kite control through the use of our water proof radio helmets. This allows you to accomplish kite skills on your own while still having the knowledge and skills of an instructor right at your side! ​Even the experienced kiters can be a newbie. 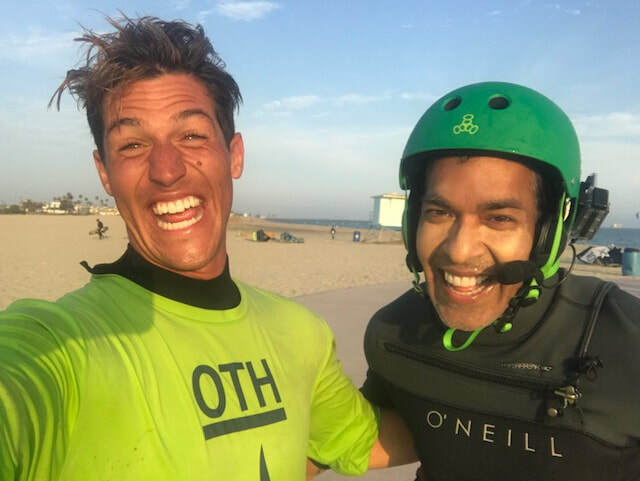 Whether you’re looking to simply work on your board starts, transitions and going upwind, or you’re looking to add foiling to your kiting skill set this is a private lesson completely customized to you and your goals within the sport. We can help you with anything from the basics to wave riding, big airs, unhooked tricks, and everything in between! Our instructor Jesse with his student during their second lesson. Getting ready to send it on the water! ​The Go Big Package combines both of our Newbie lessons with all 4 hours of instruction at one low price! This lesson is typically split between two days, great for a full weekend of fun with the kites! This package also includes our Welcome to Kiteboarding Goodie Bag! By booking now you will be booking your first 2 hours of instruction. This package is ideal for the individual who wants to fully dive into the sport. 8 Hours of private instruction at a savings of $200! This time can be used all for one person or split evenly between two individuals. So if you are looking to dive in solo or with a friend this is the package for you! This package also includes our Welcome to Kiteboarding Pro Goodie Bag! By booking now you are booking your first 2 hours for a single individual or 4 hours for two individuals. Shared stoke between instructor and student! Getting to see students push their boundaries and hit goals is awesome for everyone!